Fornebu, Norway, 2017-May-01 — /Travel PR News/ — Low-cost airline Norwegian’s loyalty programme, Norwegian Reward, is continuing its UK expansion by launching the Reward eShop with Collinson Group, the first loyalty points earning eShop offered by a low-cost airline in the UK. 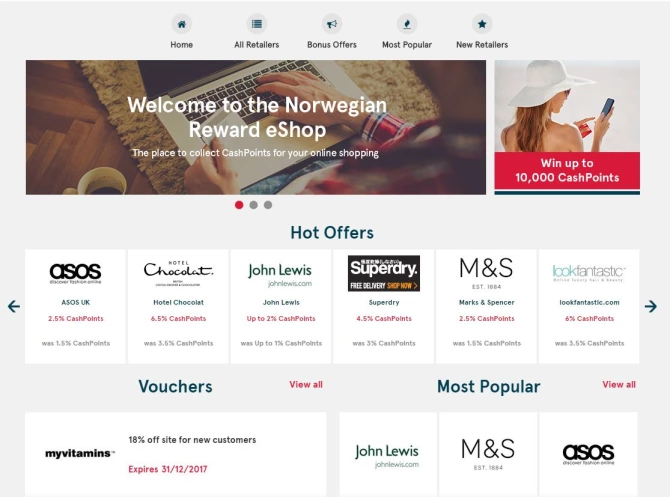 Norwegian Reward members can now earn points for online shopping at nearly 1,000 UK retailers including, Tesco, John Lewis and Marks and Spencer, which will help reduce the cost of Norwegian flights. Norwegian Reward is the loyalty programme of Europe’s third largest low-cost airline, Norwegian. It is free to join and members earn CashPoints, the programme’s currency, which reduces the cost of flights with Norwegian. CashPoints can pay for Norwegian flights partially or in full and can be used to pay for extras such as checked baggage and seat reservation without any restrictions. The Reward eShop offers a selection of almost 1,000 of the UK’s favourite retailers where Norwegian Reward members earn CashPoints for online purchases with supermarkets, department stores, utility companies, electricals, clothing and fashion, home and garden, and more. Members can browse, shop and earn a percentage of their total spend in CashPoints or a fixed number of CashPoints per purchase and receive discount vouchers. Norwegian is also launching a competition to mark the new Reward eShop, giving one lucky customer a chance to win 10,000 CashPoints worth around £1,000, enough for a pair of return flights from London to New York, simply by shopping at the Reward eShop. Five runner-up prizes of 2,000 CashPoints worth around £200 are also available. Brede Huser, SVP at Norwegian Reward said: “Norwegian Reward is quickly growing its partner network in the UK to give more choices to our members and to make their money travel further when flying with Norwegian. The Reward eShop is powered by Collinson Group, which has relationships with more than 4,000 retailers worldwide, allowing Norwegian Reward members to earn CashPoints at online retailers. Members can access the Reward eShop on desktop, mobile or tablet where they will benefit from the same prices, discounts and bonus offers offered directly by the retailers while earning CashPoints on every purchase. Norwegian Reward has more than 700,000 members in the UK and nearly 5.5 million members worldwide earning exclusive benefits and cost savings on Norwegian flights. Members can also choose from a new reward every sixth flight of either free baggage, free seat reservation, free fast track or a CashPoint boost, which is valid for use for up to 12 months. The airline will be taking off its biggest summer ever with 10 new transatlantic routes from Edinburgh, Belfast and three cities in Ireland to the USA using the brand-new Boeing 737 MAX, where Norwegian Reward members can also earn CashPoints on flight bookings. Norwegian Reward is the award-winning loyalty programme of Europe’s third largest low-cost airline, Norwegian. The loyalty programme launched in 2009 and currently has almost 5.5 million members worldwide earning CashPoints which helps reduce the cost of travel with Norwegian. Norwegian Reward won the “Best up-and-coming Award” at the 2016 Freddie Awards. This entry was posted in Adventure Travel, Airlines, Airports, Business, Tour Operators, Transportation, Travel, Travel Deals, Travel Management, Travel Marketing, Travel Services, Travel Tips & Info, Travelers and tagged Brede Huser, CashPoints, Collinson Group, eShop, Freddie Awards, James Berry, John Lewis, Marks and Spencer, Norwegian Reward, Tesco, UK. Bookmark the permalink.